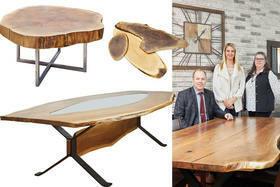 Combining the past and with the present creates timeless design in Ottawa. 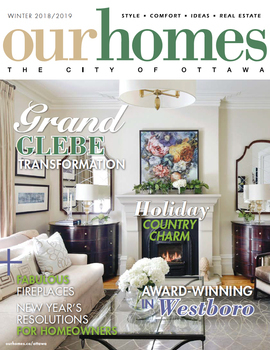 A version of this article originally appeared in the Winter 2018/2019 issue of OUR HOMES The City of Ottawa, p.252. Find local businesses in our Ottawa directory. 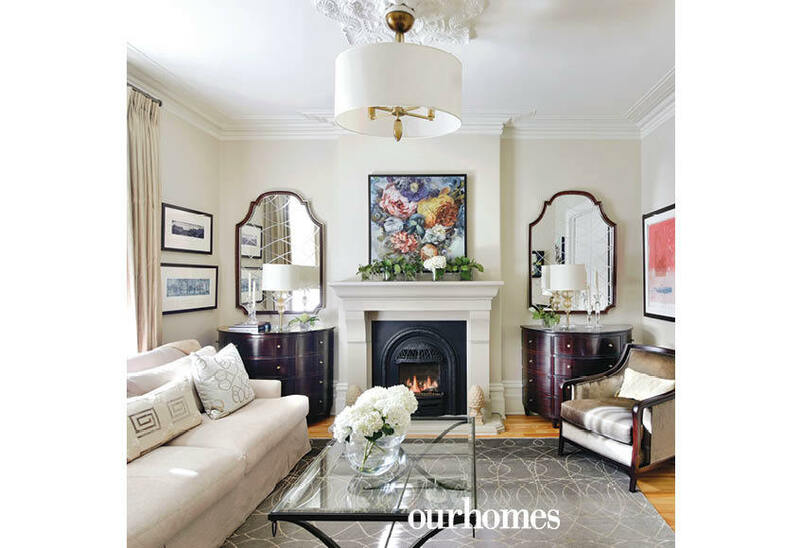 The bright smile from homeowner Denise Carruthers reflects the exact style of this Glebe home: warm and welcoming. 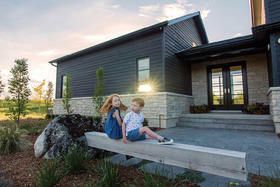 Denise’s home is unmistakably built for her family: husband Dan, 13-year-old daughter Kaylah and friendly corgi Keilidh. 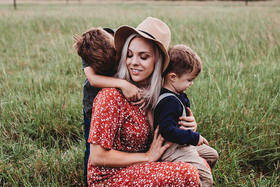 The Carruthers’ home combines warm and bright elements beautifully with a mix of dark and light tones. Skylights beam daylight into each room, lifting the tones from the interior décor. 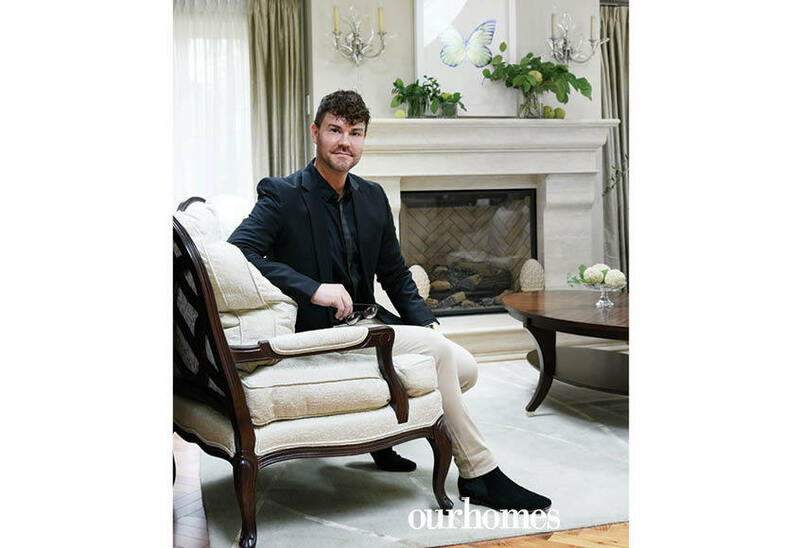 “My largest challenge was to accommodate and integrate beautiful original antique pieces that belonged to the family’s ancestors,” says Luc, like a dining table brought over to Canada from Edinburgh by Dan’s great-grandfather when he came from Scotland to work on the railroad. The kitchen has glass doors on the small cabinets near the entranceway to showcase china. The large island has comfortable high-back chairs. 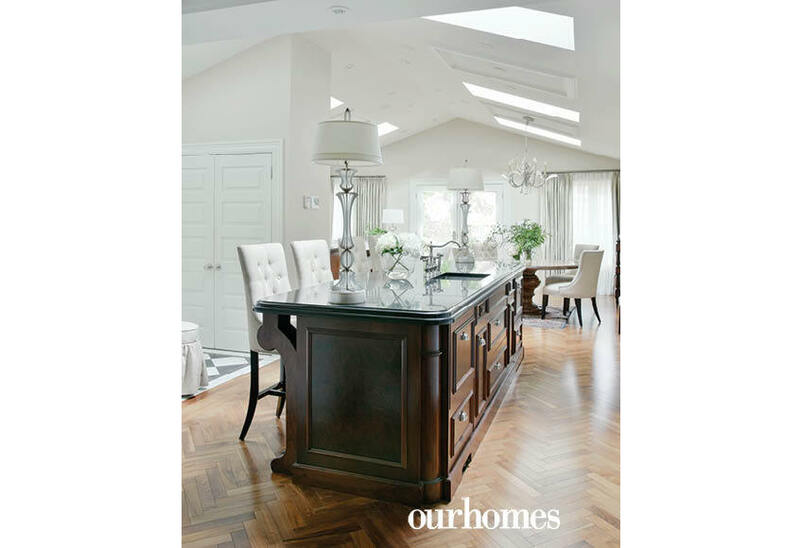 The herringbone flooring creates clean lines while the pattern adds depth and character. The kitchen also has an eat-in dining area that flows into the family room. For their 20th anniversary, Denise surprised her husband with a man cave off of the garage, complete with Beau’s keg. Storage is concealed behind dark panel walls. Many features of the house are original, including the crown moulding, baseboards and refinished pocket doors. The home also has a wealth of interesting, unique and special artwork, featuring local artists Christopher Griffin, Andrew King, Catherine Jeans, Shannon Craig, Philip Craig and David Lidbetter. The front foyer presents a pleasing contrast of black and white, the perfect backdrop for the stunning Ray Caesar artwork that hangs on the wall. 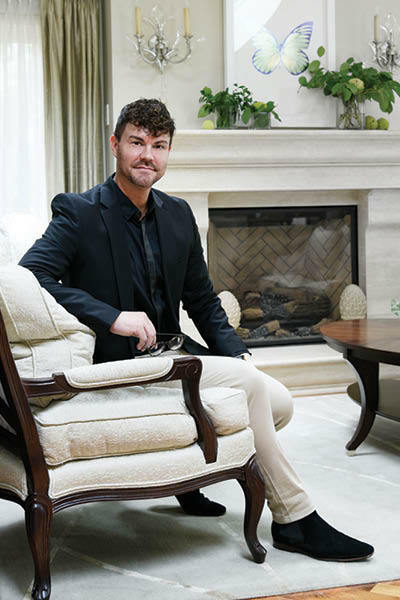 Designer Luc Crawford drew inspiration from the family’s past to create a uniquely warm home for their present. Sunlight pours into this cosy family room, thanks to broad skylights. 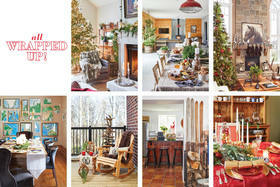 The room invites guests for some quiet time after eating in the main dining area. 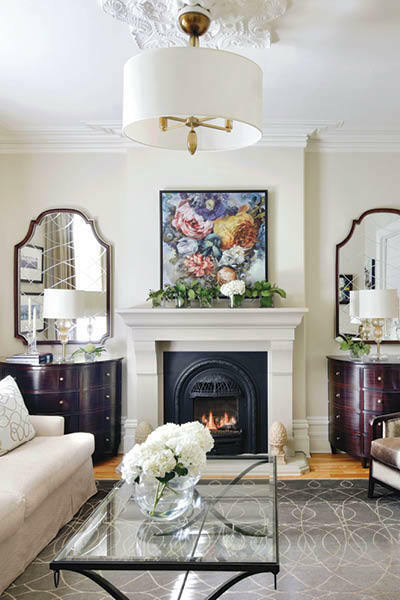 Custom furniture and décor including original artwork with bright flowers add distinctive charm to this home, as seen here in the living room. 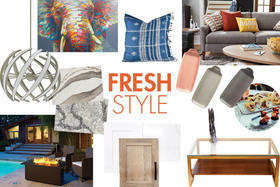 A glass-topped coffee table helps the room feel airy. 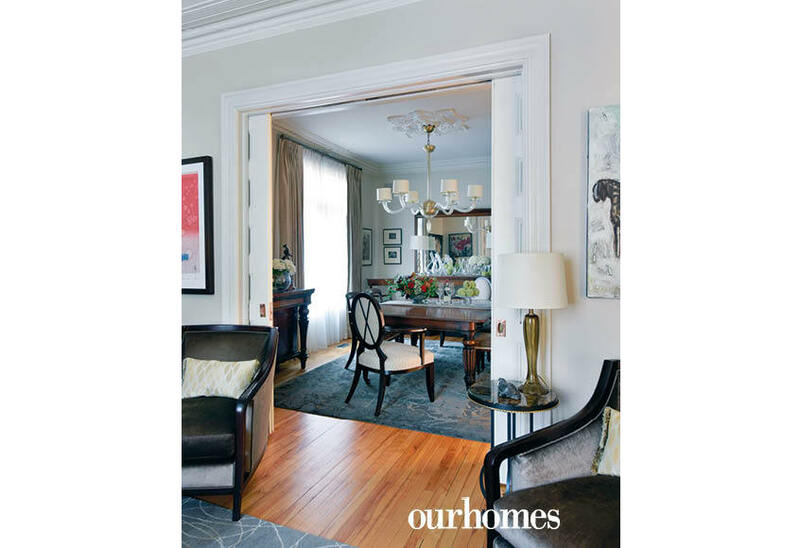 Pocket doors lend symmetry, character and functional division to the formal dining room, which features a family heirloom dining table. Stylistic period influences abound, including ornate ceiling medallions in the dining room that are original to the home. 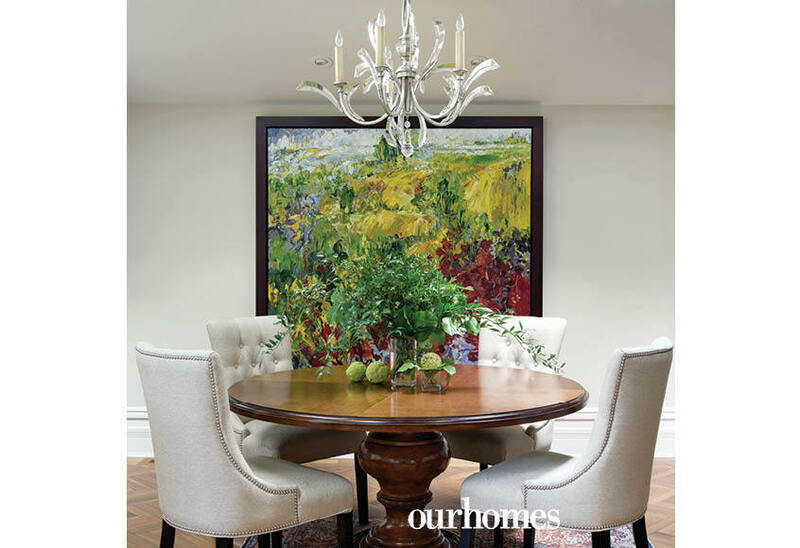 A contemporary artwork in bright colours reads “Blah blah blah” in cheeky contrast to the home's classic elements. 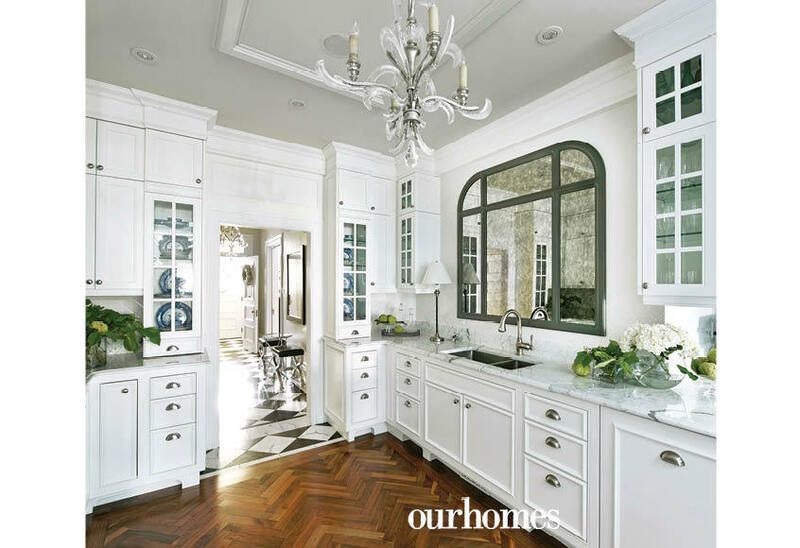 A large black-framed mirror gives dimension to the white kitchen. White cabinets with silver cup pulls have a traditional look while glass-fronted cabinets display treasured blue china. 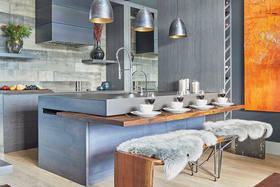 If the kitchen is the heart of the home, then this gorgeous island, rich with colour and texture is the centre. It leaves an even larger impression set against herringbone floors. Skylights over the eat-in dining area and family room keep the space incredibly bright. 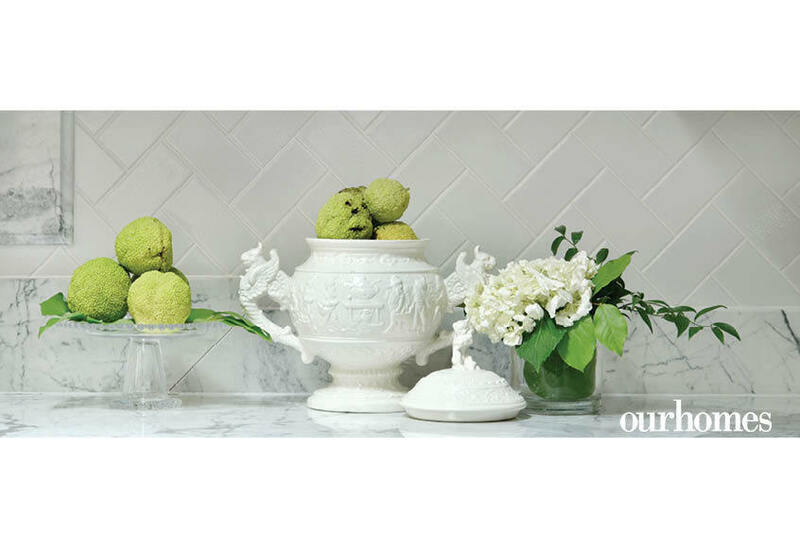 A soup tureen belonging to the owner's grandmother is a cherished and sentimental item on display in the kitchen. 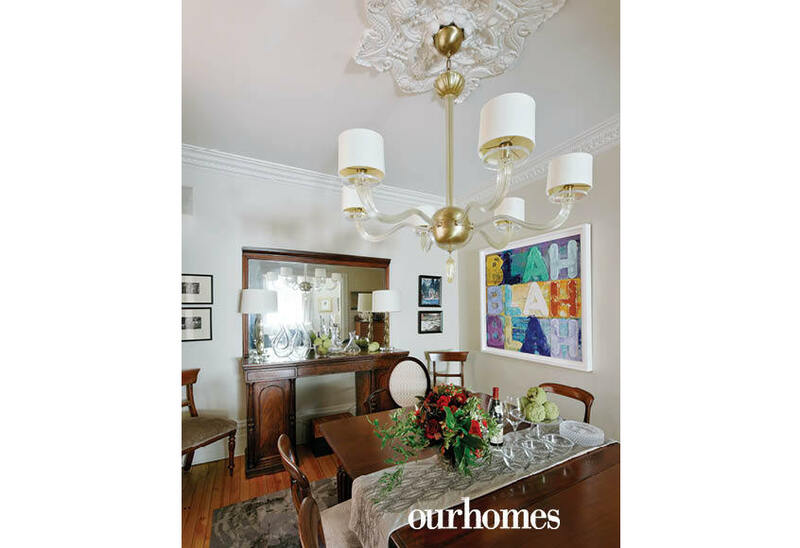 Smart and sophisticated chandeliers appear in a number of rooms in this Glebe home. This pretty piece does double duty by amplifying the natural light in the eat-in kitchen. A large canvas offers bright colours. Black and white checkered tiles add visual texture to the powder room. A large mirror and light fixture have similar elegantly swooping lines. The third level of this home was transformed into a master bedroom sanctuary. A platform bed and padded headboard are contemporary in style, while built-in shelves balance with darker wood tones and fill in spaces under the eaves. The sitting area of the master bedroom is perfect for curling up with a good book in front of the fire. The master bedroom retreat on the third floor features a gorgeous en suite. The statement-making light fixture, sleek tub and bold vanity are wonderfully set off against the tile floor. 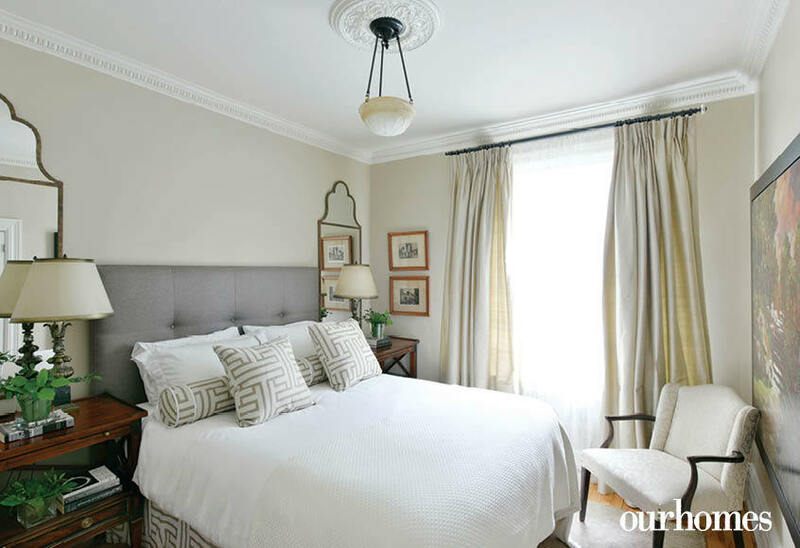 The crown moulding and ceiling medallion speak to the age of the home, however geometric bedding and simple window coverings give it a contemporary feel. An elegant pedestal sink and claw-foot tub pay homage to this home’s near century-long history. This man cave adds a whole new dimension to the garage party, complete with Beau’s beer on tap. 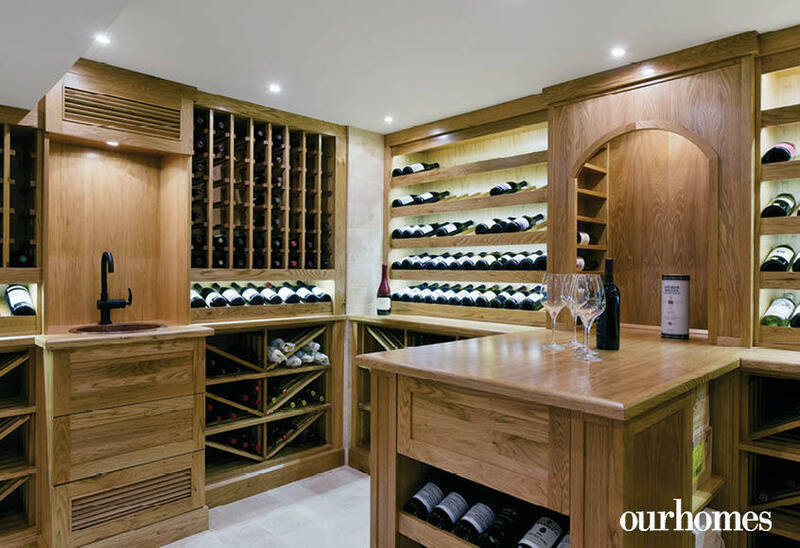 One of the many touches that make this home truly next-level is a sizeable wine cellar.